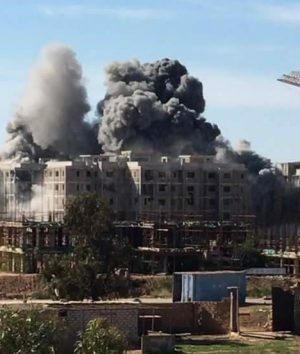 What had seemed to be the end game for the terrorists in Benghazi’s Ganfouda district a week ago has turned out to be a bloody siege of a group of apartment blocks which today cost the Libyan National Army five more dead and 15 wounded. An unknown number of terrorists is continuing to resist the LNA, whose casualties today came from the Saiqa Special Forces. An airforce jet scored what seemed to be a direct hit on the apartments sending up a huge plume of smoke and dust. But resistance does not appear to have slackened. One LNA source said that earlier in the day a group of terrorists had tried to break through the army’s lines but had been beaten back. The inability of the LNA to justify its claim of total victory a week ago is not only embarrassing but appears to be holding up moves to assault the remaining terrorist positions in the city’s downtown Sabri and Suq Al-Hout districts. A number of units had been pulled out of Ganfouda and redeployed on the edge of these two remaining militant enclaves. 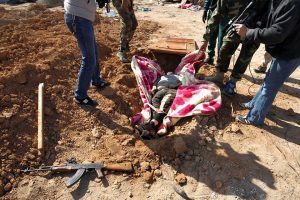 Soldiers have also today uncovered a mass grave in Ganfouda which contains an unknown number of bodies. Forensic experts are now examining the corpses, some of which appear to be quite recent. It is unclear if the dead are terrorists, civilians or captured members of the LNA.